Elizabeth has been exclusively breastfed (and I hope to be able to continue to feed her for as long as she needs), but I have on occasion expressed milk for her to drink from a bottle if I have need to pop out or have an appointment. At first she resisted but then when she realised the boobies were not available she seemed to take to it ok. When Elizabeth turned 6 months and started weaning, I wanted to start giving her cooled boiled water with her meals but didn't want to get her into a habit of drinking from a bottle on a regular basis so we decided to try some Trainer Cups with her. As you may know we recently reviewed the MAM Perfect Soother (see full review here). 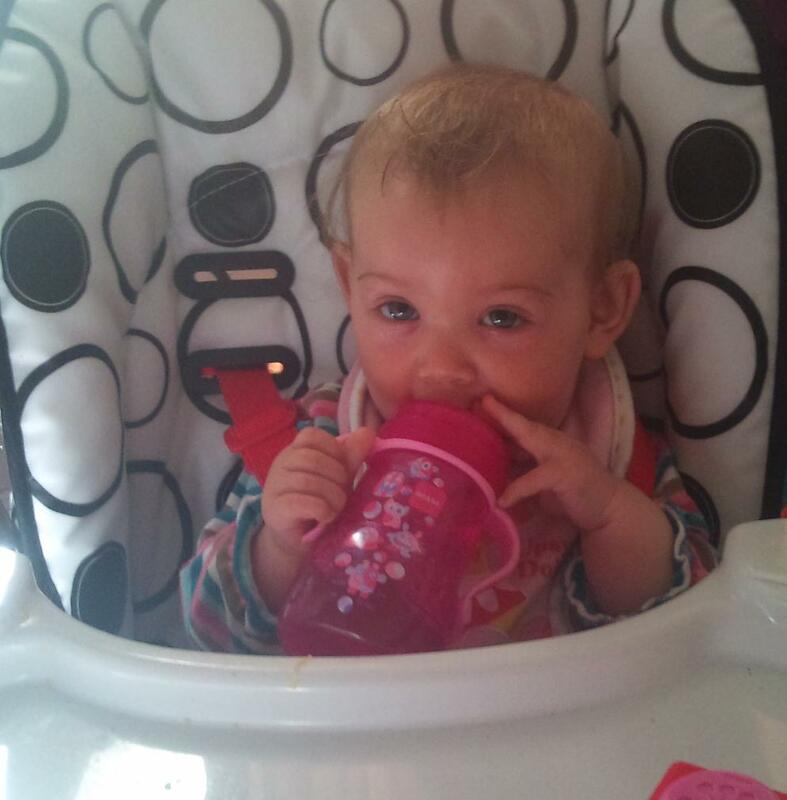 Well the lovely people at MAM also sent us out one of their lovely Trainer Cups for Elizabeth to try! 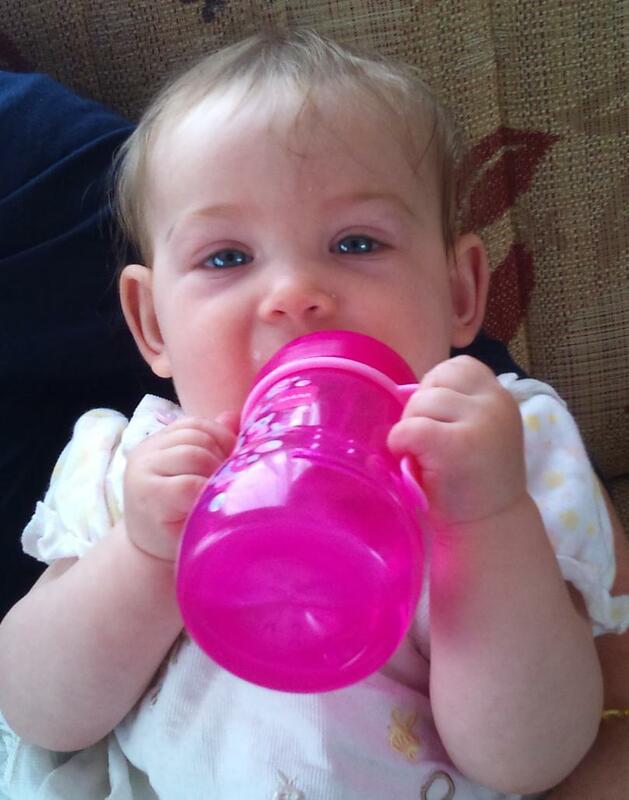 When the cup arrived and we opened the packaging Elizabeth's eyes were immediately drawn to the bright pink colour and wanted to play with it straight away! The MAM Trainer Cup is suitable from 6 months + and hold's up to 220ml of water (or milk). It has a soft, spill-free spout ideal for the dynamics of everyday life and detachable handles that are perfect for little hands to grasp! It has a useful liquid level indicator just like on the bottles and comes with a matching transparent lid. 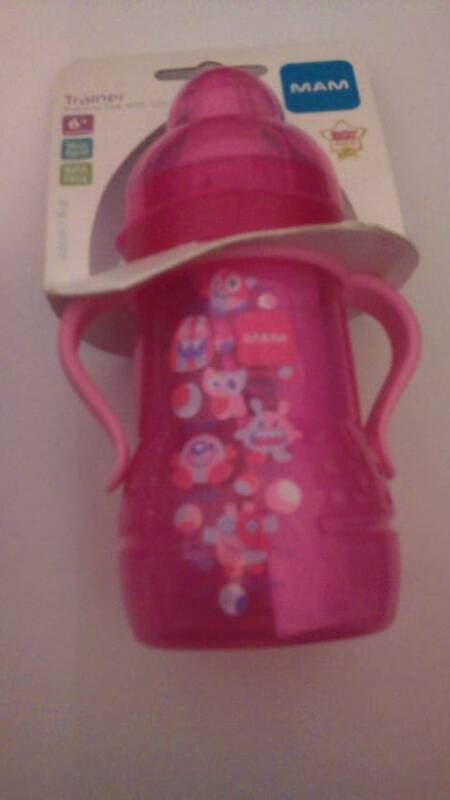 Like all MAM products it is BPA free and can be easily sterilised. We were sent the MAM Trainer cup in Candy Pink but it is also available in Pacific Blue for little boys! At Elizabeth's next meal time along with some pasta and veggies I gave her the cup with some cooled boiled water in it. 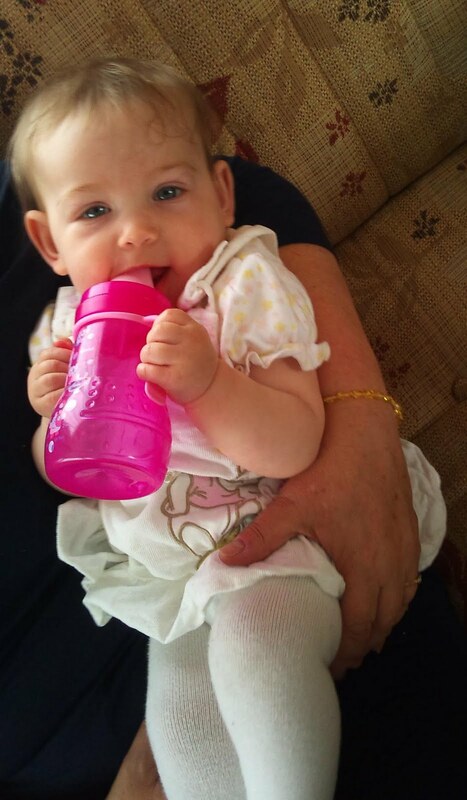 At first she just seemed to play with it and did tip it up a couple of times spilling the water slightly but as I encouraged her to hold the handles she began to get used to it and after now using the cup regularly over a few weeks, holds it and lifts it to her month herself! The soft spout is ideal for her as she is teething and can be quite sensitive to anything in her mouth at the moment but she loves chewing on this in between sips of water! The detachable handles are fantastic (now Elizabeth has got the hang of holding them the right way up!) and the fact that you can remove them would be ideal for babies who are more used to holding bottles as you could introduce them to the trainer cup without the handles first and then add them on, gradually progressing towards using it more as a cup. The MAM Trainer Cup is good value for money retailing at £5.50 (which is about average for a non spill cup) and can be purchased from the MAM website here. If the spouts get worn instead of having to buy a whole new cup you can replace just the spouts, a pack of two is available on the website here for just £3.05. Remember to 'like' the MAM UK page on facebook to keep up to date with all their offers and giveaways! What a good idea to put the milk into a cup instead of a bottle. I am like you and wanting to start expressing a bit more so I can get out and about but have been putting it off not wanting my LO to use a bottle. I will definitely give this MAM cup a try. Thanks for the review.